Are You Afraid of Your Child or Teens Out of Control Behavior? Do you walk on eggshells around your child, afraid of doing anything to set him off? Do you appease him when you notice he’s winding up to throw a tantrum? 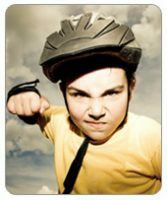 In part one of a two-part series, James Lehman, MSW explains how fear of acting-out behavior sets up a dangerous pattern for your child—and the whole family. All parents experience fear for their kids. They worry about their children getting sick, doing well in school, and whether or not they’ll be able to get a job and succeed in life. Being afraid for your kids is very normal, but being afraid of your kids is a phenomenon that has developed over the past several decades, and something that parents need to look at closely. And by the way, sometimes these two fears are actually tied together—fears about their child being able to make it in life actually will cause some parents to think they have to give in more; they become a cushion for their kids because mastering life skills seems so difficult for their child. But let me be clear: that’s exactly what you don’t want to do. When a child is two or three, he learns to respond by saying “no” all the time. He starts resisting and asserting his individuality from his mother and father and often manages his anger and frustration by throwing temper tantrums. Some parents learn that you just have to wait those tantrums through, but others begin to worry that they’re not able to manage their child or that they are not in control. Others worry that if they don’t give in—if they say “no” to their child—their child won’t love them anymore. In effect, these parents become afraid of their child’s acting-out behavior and are held hostage by it. They get worn down and often begin caving in to inappropriate demands as they try to appease their child instead of remaining firm and waiting the tantrum out. So their young child develops a pattern of acting out because it works for him—it gives him power and gets him what he wants. When the tantrum happens in public, the parent feels embarrassed, humiliated, and ashamed. When it happens in private, they feel stuck in this negative cycle with their child: they’re alone in the house and their child is screaming and yelling and kicking. Their life seems crazy and out of control, but they don’t know how to stop it without caving in to their child. These kids soon learn to blackmail their parents with the threat of throwing a tantrum. Pretty soon, the parent starts giving in as soon as their child starts to signal that they’re going into a tantrum: maybe their child’s voice escalates or becomes shrill, or maybe they stomp their feet and scream “no.” Once that happens, a very serious pattern has begun. Now the child has actually trained the parent to give in to their demands, no matter what. If your child knows he can get you to give in by behaving inappropriately or destructively, he’s going to learn to give you those cues. It’s just like being in a play: when you get your cue, you’re going to read your lines: “It’s OK, don’t do that, I’ll get you the toy.” Or you’re going to bribe him: “Well, if you can hold off for five minutes, then I’ll get you a candy bar in the car.” What you’re really doing is negotiating on your child’s terms; your fear that he’s going to act out or that you can’t handle the tantrum is going to dictate how much you give in. And by the way, parents don’t know this pattern is forming while it’s happening. This is not a conscious thing where people say “I’m going to give in to my kid and then he’s going to become a monster.” They’re saying, “Oh man, I can’t handle this right now.” And their child learns from that lesson that when you can’t handle something, he’ll get what he wants. So his goal then, when he wants something and you tell him no, is to set up situations you can’t handle. Remember, this is not a moral issue for your child: it’s not about being good or evil. Your child is not really conscious of the effects of his behavior other than it gets him his way. Children, like all living things, learn to take the easy way out. The important thing is not to blame your child or assign diabolical motives to his behavior. It is important to realize that if your child is using inappropriate behavior to get his way, it’s not a phase that will magically stop when he turns ten or twelve or even fifteen. That pattern of behavior may continue on through adolescence and into young adulthood. If a child has successfully used inappropriate behavior at home, you will often see them trying it out at school. After all, if their strategy works on their parents, why shouldn’t it work on their teachers, too? In kindergarten and first grade if they don’t get their way they may escalate. They may tantrum, call people names, throw things on the floor and walk around in the classroom when they’re supposed to be sitting down. It’s important to note that for a significant number of children, the classroom structure that teachers utilize will be sufficient to change some of these behaviors. I’ve found that many of these kids also have a learning disability or some other factor that interferes with their ability to learn to solve problems. Think of it this way: if you have dyslexia, Attention Deficit Disorder or auditory processing problems, you might perceive the world as a threatening place. For these kids, it’s often much harder to learn how to solve social problems through reasonable negotiating, being patient, and learning how to accept no for an answer. So what tends to happen is they solve their problems by acting out—and that becomes their one default skill. They’ve developed this one trick: “Agree with me or face my crappy behavior.” And that can become their strategy for solving all problems. “Give me my way or face my crappy behavior.” They do this in school, at home, and on the bus and as long as it works, they will continue to use it. Not only is the child controlling others with his behavior, he’s not learning the problem-solving skills that he desperately needs to learn to be able to make it in life. If everyone around him is backing down, all he’s learning is how to threaten and intimidate others through fear. When parents used to come to me with this problem, I’d say, “We’re going to come up with a plan to change what’s happening in your house. Let’s figure out some things for you to do when things get tough so you can empower and support yourself.” I think it’s nearly impossible for people to try to rely on willpower alone to change their parenting style. Here’s the truth: their child’s behavior wasn’t going to change unless the parents’ behavior changed. I believe if you work at it, things will change; and if you don’t, things will stay bad or get worse. The kid who’s throwing a tantrum today is going to be throwing your chair across the room in ten years. And that’s how he ups the ante as he gets older. Most kids escalate; it’s a natural progression. They have to be more intimidating. When you’re 13, it’s very awkward to lie on the floor and throw a tantrum. It’s much easier to throw something across the room and hit the wall. You see these kids punch holes in walls all the time; that is the evolution of their tantrum. Certainly as they get older, the intimidation becomes more real. There are kids who hit and push their parents. There are kids who intentionally break and damage things around the house. There are kids who hit their siblings or hurt them emotionally by calling them foul names. And make no mistake, this becomes a very real problem. If your child has trained you to be afraid of him and back down when he acts out, realize that whatever authority you had originally has diminished over time. When these kids are really in flower—when they’re really showing who they are—you can’t tell them anything. They’ll tell you to kiss their butts. You can’t tell them when to come in at night; if you put them in their room, they’ll climb out their window. Basically, they’ll come and go as they please and they’ll say, “You can’t stop me.” The sad part is that unless you change the way you parent and start holding them accountable, they’re right. In next week’s article, James Lehman will give you 7 tips on how to stop living in fear of your child’s inappropriate behavior—and learning how to start parenting more effectively.